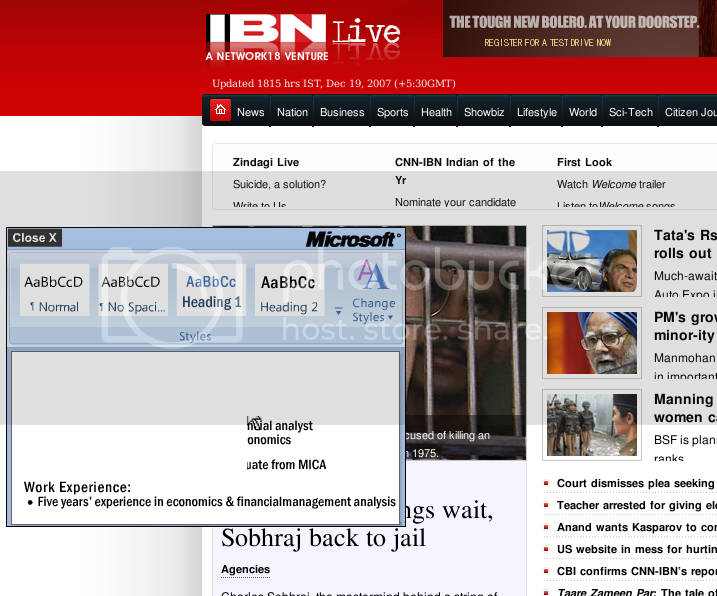 During the day I often check the news at the CNN-IBN website. They have a small little window with some advertisements popping up, which does not get blocked by using a pop-up blocker. The popup has a small little ‘close’ link on the left right hand top corner (heh got the direction wrong myself). Being a regular visitor of that page I have become used to clicking on this link. However, things were different today. Instead of the “Close” button, there was this link to the M$ site. The close button was moved to the other side (image below). So habitual close-button-clickers would be hoodwinked into visiting the M$ site first before they can get rid of the irritating pop-up. Things were worse though when the pop-ups started. The close button was nowhere to be found and one had to wait for the timeout before seeing the home-page. This entry was posted in Uncategorized and tagged wierdness on December 19, 2007 by runa.